CTV's Robert Fife has broken a monumental story this week that not only gives a rare glimpse directly into an abuse of power, but also serves as a reminder of the importance of great investigative journalism and the role it plays in holding governments to account. In Mr. Fife's reporting this week, he alleges that back in February Prime Minister Harper's Chief of Staff Nigel Wright gave Senator Mike Duffy $90,000 so that Mr. Duffy could pay back a massive amount of expenses that he seems to have illicitly charged to the Senate's tab. Mr. Duffy then paid the Senate with his own personal cheque, never revealing that the Prime Minister's closest advisor had gifted him money. As part of this deal, Mr. Fife reported that Sen. Duffy and Mr. Wright agreed that the Prime Minister's Office would arrange for the forthcoming Senate report on three Senators being investigated for improper expenses to "go easy" on Sen. Duffy. Last week, the Conservative-controlled Senate committee released three reports on improperly charged expenses, and they did indeed come down much harder on the two other Senators -- a Liberal, Mac Harb, and the now Independent Senator, Patrick Brazeau. The Senate report was worded in a way that distinguished Mr. Duffy's case from the two non-Conservative Senators, by emphasizing how Mr. Duffy had already paid back the expenses -- supposedly voluntarily. At first blush, it might seem like the whole benefit of the Wright-Duffy deal accrued to Mr. Duffy. So, what did the government, and indeed the Conservative Party, gain? We do not know for sure yet -- which is why the NDP has called for the Senate Ethics Officer, the RCMP, and an Independent Advisor to look into the matter. The need for such investigations is made all the more apparent when we contrast the Prime Minister's Office (PMO) statement, which acknowledges that Wright gave Duffy the money to pay back the Senate, with Mr. Duffy's claim that he took out a loan to pay back the Senate and that Mr. Wright was not involved. That said, what Stephen Harper's government appear to have gotten in the deal was the benefit of Sen. Duffy remaining silent on his expenses which silence would help put a stop to a series of embarrassing and politically damaging stories about Conservative Senators including Mr. Duffy. Further, each side in this deal would mutually benefit from a messaging campaign that would attempt to dress Duffy up as a paragon of virtue who had done the right thing, by supposedly paying back the money from his own pocket. The portrayal of Sen. Duffy as the chastened but honourable Senator would then be contrasted with the non-Conservative Senators who could be conveniently hung out to dry by the Conservative-controlled Senate committee. 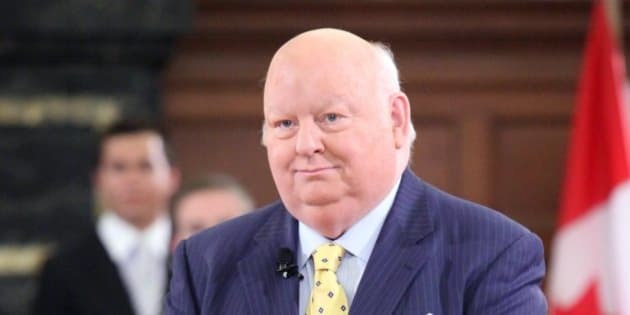 This strategy of praising Mr. Duffy was obvious listening to statements that have been made in the House of Commons by the Prime Minister and others, like Conservative House Leader Peter Van Loan who went so far as to hail Duffy's "leadership" on the Senate expense scandal. From all this emerged an effort by the Conservative distortion machine to make Mike Duffy -- and, after his role was revealed, Nigel Wright too -- into some sort of ethical heroes. This effort reached new depths of ridiculousness when the Conservatives' designated MP responsible for bald-faced silly arguments, Pierre Poilievre, appeared on TV panels Wednesday to reassert these claims with a focus on how Mr. Wright was a saviour of taxpayers' money, amidst Mr. Poilievre's own apparent confusion on what he was told to say -- or not to say. With respect to honour, Mr. Duffy may not yet have reported the $90,000 from Mr. Wright as a gift under the Senate's Conflict of Interest rules, which require reporting on gifts of over $500 that relate to a Senator's position. Also, if it were not for the reports from Mr. Fife and others, nobody would know that Sen. Duffy's 'voluntary' paying back of the illicit expenses was in truth funded by Stephen Harper's right hand man. Whatever the exact details of the Wright-Duffy deal, acting in secret in this fashion is a strange way to behave "honourably." Ultimately, independent investigations will be needed to determine why Mr. Duffy's repayment to the Senate could not come from his own pocket. At minimum, it seems likely that this was a condition for Mr. Duffy to agree to repay the Senate. And it also seems likely that the Conservative Party saw great value in having Mr. Duffy stay silent. Ironically for Mr. Poilievre, if Mr. Fife's reports, and the PMO's admission, are to be believed, then Mr. Duffy received $90,000 to pay off his expenses because he has a rich and rather well-connected friend who sits at the Prime Minister's elbow. Honour, indeed.